Coming in to the new year, I thought I knew what God wanted for me. Not in the full context as in- I knew what the year would hold- but in the context that I thought I knew what I should seek for in my relationship with Him and for my "goals" for the new year. I laid down for a nap a couple of weeks ago and as I did, I asked the Lord what my "word" for the year was. I had sort of an in between sleep and awake "nap" because it was a Sunday afternoon and my kids don't believe in Sunday afternoon naps which I think might be blasphemous, but anyway. I woke up from my nap with one string of words running through my head..."out of the overflow"
and I knew instantly what they meant. I literally felt as though I was running on empty many times. And the truth is I was. There were many different things I was juggling...and I was trying to be perfect at all of them. Never would I have admitted that then, or even realized it. But at the root of my soul...the really deep parts of my heart...if I am being honest, I battle with perfection. When I do something, or go after something, I want to either be really good at it, or I don't even want to do it. It's extreme. No grey area for me. No grace. meant that eveything I would strive to be "better" at this year...my kids, my home, my marriage, my ministry, my business...would all have to be out of the overflow of what was already there. Meaning a fullness from Him. Being the person I am, I took these words and decided what I needed to "do" to make that happen. I examined where in my day I could make the time to fill myself....in the mornings when it's only Bella and me, I could make that my quiet time to do my bible reading. While I'm folding laundry or emptying the dish-washer...I could listen to a pod cast. While I'm running I could listen to praise & worship on pandora. I had a really good day the first day I did all of this. Which is pretty funny, because you would think I'd learn that just when I think I have it all figured out, it's then that I fall flat on my face and realize I never did. ....but then I fell on my face. Not in the literal sense, but I had a day where I felt really exhausted, defeated, discouraged.... And it was right after the day where I felt like I did everything right... Where I filled all those action steps and went to bed feeling pretty good about myself only to wake up and have it all go wrong. It's not that I think God wants me to fall on my face. It's not even God....thats the thing, it's me. Any time I try to do things on my own, in my own strength or will, I always fail. Either right away or in the long run. Action steps look pretty similiar to works.....In fact they are. there isn't anything wrong with works unless, they are done without faith. In that case, they can be pretty exhausting because they come from an empty place. The two need each other...faith and works. The bible says so in James that faith without works is dead. I struggle with finding the balance between the two. There in the struggle...is Grace. Grace on the days I don't feel like a good mom. Grace on the days I don't feel like a good home maker. Grace on the days I don't feel like a good wife. the list could go on...and on. One word stands out to me in all of those scenarios..
Our emotions are a fickle thing. I don't want to be grounded in my emotions. I want to be grounded in grace. 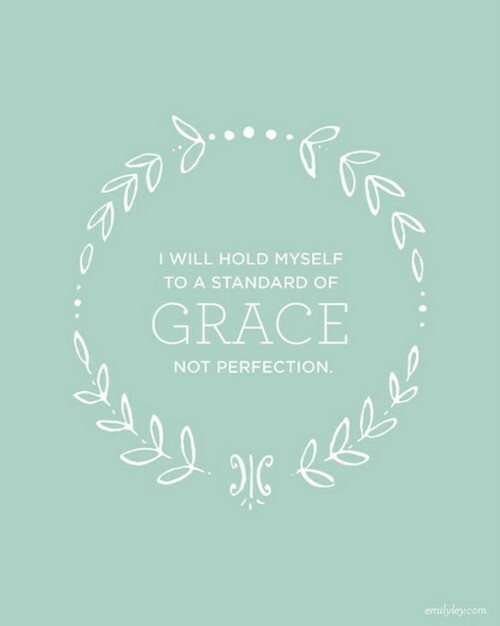 I don't want to strive for perfection, I want to rest in God's grace. In Confidence that even when I don't feel good enough, God says I am. All the things I am striving for this year will only be perfected out of the overflow of a genuine, grace-filled relationship and reliance on HIM. Not my own abilities or gifts or even downfalls and mistakes. That is what I am seeking today. And every day this year. His grace is more than sufficient and it's made perfect in my weakness. Thank the good Lord for that. The one and only "action step" I have to do is open my hands and ask God for help. I've written about grace before. This reminder of my need for grace is not new to me. It's sort of a continuous theme in my life. Please know this is not me declaring I figured it all out. Again. I will probably need another reminder. I will probably fall on my face again. But when I do, I will fall into and rest in the knowledge of God's grace. Thats what he wants after all. Love that. You & I are so much alike in in a lot of ways...I'm learning that more and more as you post :) I posted my "word" last week. It's something I started last year. It goes so much deeper than a resolution...and ultimately accomplishes more in me! Thanks for sharing your struggles. I pray we all come to the realization that we are not perfect and can't do it all. I loved what you said at the end "The one and only "action step" I have to do is open my hands and ask God for help." Im praying for you dear one! Thanks for sharing, this is a good reminder! Love this. Love you. The end. feel, only what you believe!" I needed this so bad. Wow. I am in Awe of this . This is me to a T, and His Grace and mercy is there when I fall short. Grace isnt foreign to me at all. But I am so hard onyself and this is exactly what I needed to hear! I just Love Love Love this! Thank you for your transparency! I lay here in bed with tears in my eyes because You have just written what has been in my heart. Thoughts and feelings that I haven't been able to put into words. I am so grateful through your words how God is speaking to me. GRACE is something I need to meditate on and soak it up. Thank you, thank you, thank you! I told you before I'll say it again.. you are such a great example. Thank you for this great message and reminding me and so many others that His grace is enough. You couldn't have said it any better. What a beautifully written post that many people needed to hear! thank you for inspiring!